If anyone ever questioned whether spring in Michigan is unpredictable, they can stop now. We awoke to snow covering the ground today, much different that the 84 degrees we had a couple of Saturdays ago. 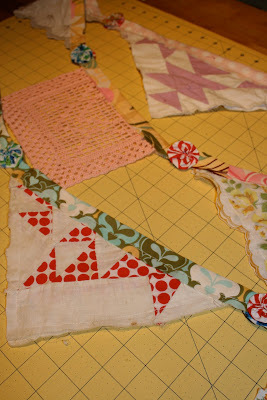 I am stuck taking indoor photos, on my cutting table, of this months "Sewing Christmas" project. For it I made an 8 foot bunting. If there was an ounce of sunshine to photograph this on my fence, I would have loved it, but today this is the best I can do. When the weather is nicer I will put it up for you. This is one of the most fun projects to date for me. I got out one bag of left over quilt binding and my large box of vintage this-and-that. It incorporates old quilt blocks, hankies, doilies, vintage sheets, yo-yo's purchased at an auction and bits of quilts that are completely worn out but needed some love. The uses for this are endless, and I think it might be the project that I "gift" to myself! If you have something you would like to share with us, please see the link below. Thanks for the idea...I have plenty of this and that to pull from! 2 inches of snow on my deck this morning....crazy! I love the bunting idea. I made something similar about 4 years ago for a grandson's room, but there was a nautical theme and my idea was more like colorful semaphores. I didn't think of taking it a step farther and using old hankies, etc. and making something for myself. Love it! That's really fun! It's definitely one way to brighten a cold, snowy day. I love your vintage goodies but toegether. In Texas I am wishing for snow. It has been in the 80's. The bunting looks great, I am so behind on my projects, it may well be Christmas by the time I get one done. I have sent you a spring picture from England, we are having 70F weather at the moment. WOW!! I have enough stuff collected to make one of these but would have never thought of it if I had not seen yours!! Thanks so much! !